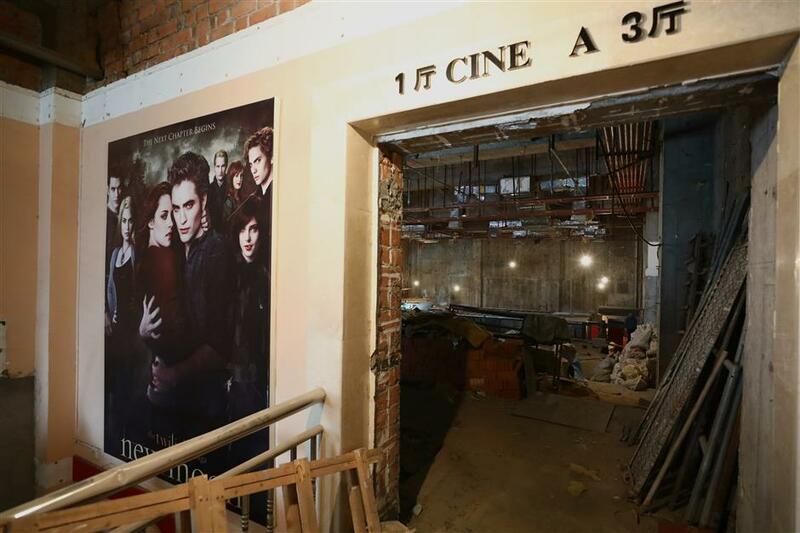 The Huxi Cinema in downtown Shanghai, established in 1926, is undergoing a major renovation and is scheduled to reopen early next year. The seven-story cinema building beside the Caojiadu Flower Market will become an "incubator” for the music industry, where young artists can create and record their own music. The almost century-old Huxi Cinema in downtown Shanghai has been closed for several months now, undergoing a redevelopment that will see it emerge as a new theater and studio dedicated to the music industry. The cinema, established in 1926, is scheduled to reopen early next year. It will retain the name Huxi, which means "Shanghai's West" and refers to what are parts of today’s Putuo and Changning districts. The more than 400 seats in the cinema's main screening room have been removed and work is under way on the main stage. 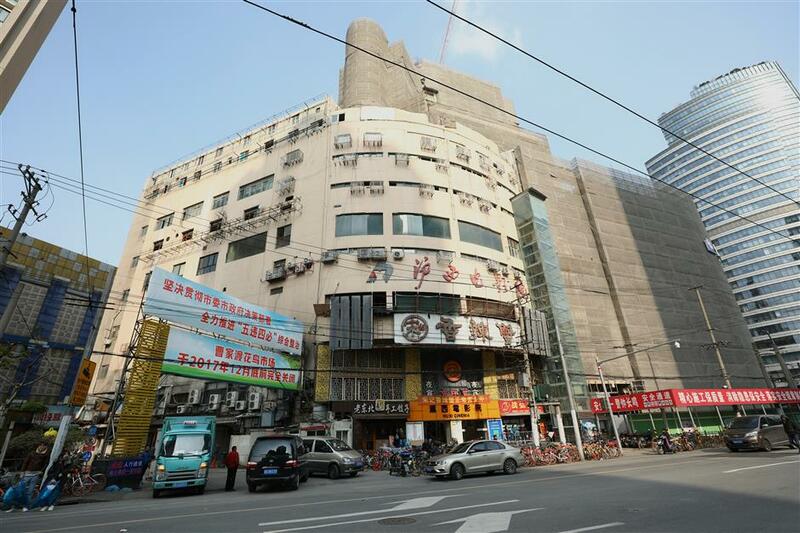 The old-style movie house, at 19 Wanhangduhou Road in Putuo District, stands beside the Caojiadu Flower Market, which will also close soon under a district redevelopment plan. The seven-story cinema building will become an "incubator” for the music industry, where young artists can create and record their own music. The revamped building will also provide several smaller theaters where operas and other musical shows can be performed. During its heyday in the 1980s, the Huxi Cinema attracted long queues of people anxious to watch the latest movies from home and abroad. Many film classics of the 20th century were screened there, including “Tunnel Warfare” and “Landmine Warfare,” both Chinese films about the resistance movement against Japanese occupation during the World War II, and imports such as France’s “Silence” and Korea’s “Flower Women”. A film poster is still stuck on the wall at the entrance to the Huxi Cinema's main hall. 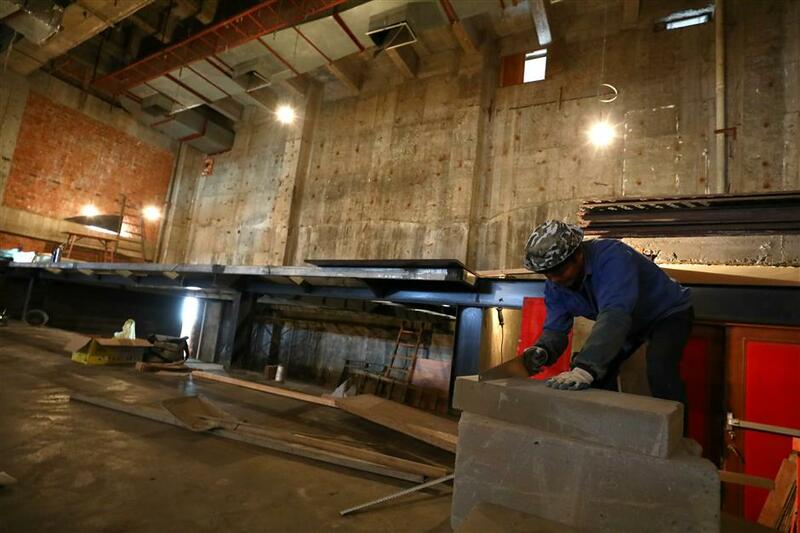 A worker builds a new stage in the former main hall of the cinema which will become a theater for various operas and shows. But fortunes changed beginning in the 1990s as new entertainment genres appeared, such as videos and karaoke. Old-fashioned movie houses like Huxi were especially vulnerable amid competition from cinemas featuring IMAX screens, three or four-dimensional experiences, and other technological gimmickry. Huxi's box office receipts fell from a record 1.8-million yuan (US$272,364) in 1997 to about 400,000 yuan in 2009. For many people in Shanghai, the Huxi evokes nostalgia. "I have happy memories of watching a film in the cinema and eating a bowl of noodles from the nearby Caojiadu market," said Zhu Guangming, a local resident. Wang Jianer, 61, who was projectionist at the cinema for the last 40 years, said he was assigned to work there upon graduation from high school. "Everyone showed me respect and tried to flatter me to get a ticket," Wang said, noting that tickets cost 0.25 yuan at that time but were still quite difficult to purchase. He recalled the time in 1976 when the Japanese blockbuster “Manhunt,” starring popular actor Ken Takakura, was released at the cinema. "Everyone wanted to see it and everyone came to queue for tickets,” said Wang, who worked nine hours a day during the screening period. 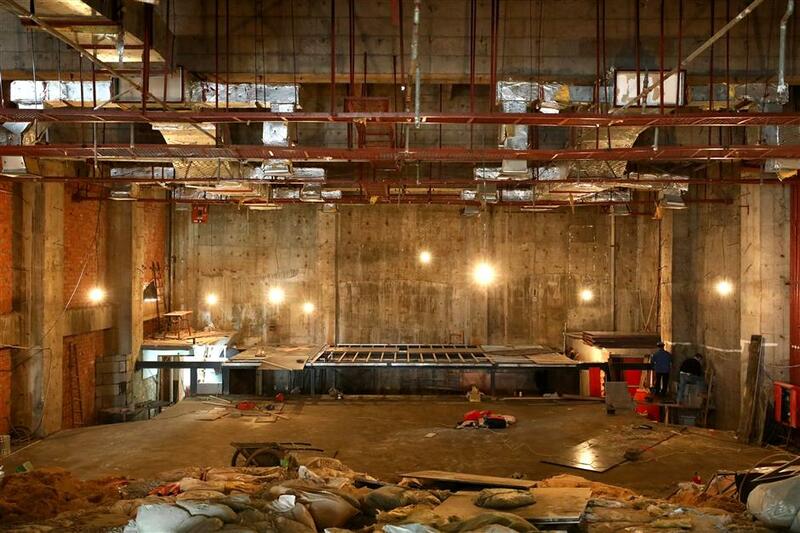 The seats and facilities in the former main hall of the Huxi Cinema have been removed for the renovation. An artistic rendition of the future theater in the main hall of the Huxi Cinema. The age of more modern cinemas was ushered into China, in part, by the nation’s open-door policy toward foreign investors. The new cinemas had multiple screens, enabling them to show different films at different hours, while Huxi retained the old-fashioned system of one film at a time in a single large hall, said Tan Wenwei, deputy general manager of Huxi. For a time, the cinema even divided its main screening hall into smaller theaters and upgraded its sound system and screen to compete with more modern rivals. It lowered ticket prices to a fifth of what competitors were charging. Despite that, more than half the seats remained vacant in recent years. 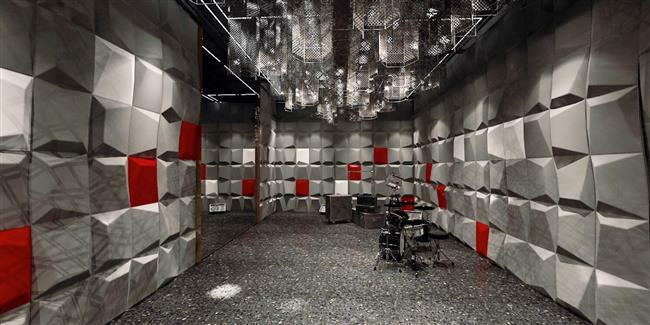 An artistic rendition of a future music studio in the former Huxi Cinema. The cinema’s makeover is one part of an urban redevelopment plan to change the face of the Caojiadu area, which is located near the junctions of Changning, Jing'an and Putuo districts and has long been a transport hub and business center. Old factories that once employed large numbers of locals have been shuttered or relocated, and Huxi Cinema’s base of customers was dispersed. The cinema had to rent out some of its space to small eateries to make ends meet. Renovation is aimed at restoring Huxi as an area icon, according to the district's culture bureau. 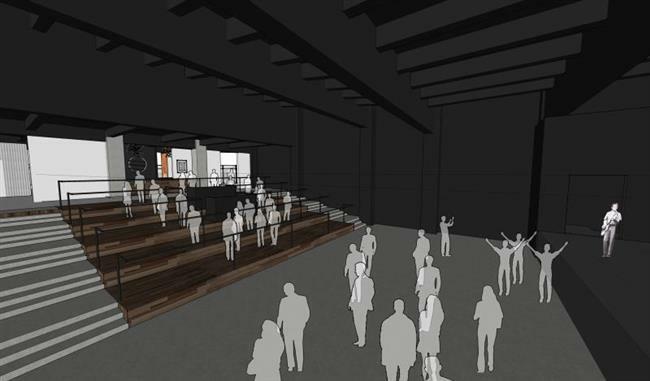 The new music and cultural center that will take over the cinema building will draw creative artists to the area. The name Huxi is expected to become a music landmark in the city. The city’s redevelopment blueprint for the Caojiadu area calls for a "comprehensive commercial center" with up-market malls and office buildings. The Caojiadu Flower Market, the largest of its kind in downtown, will be shut down by the end of this year. 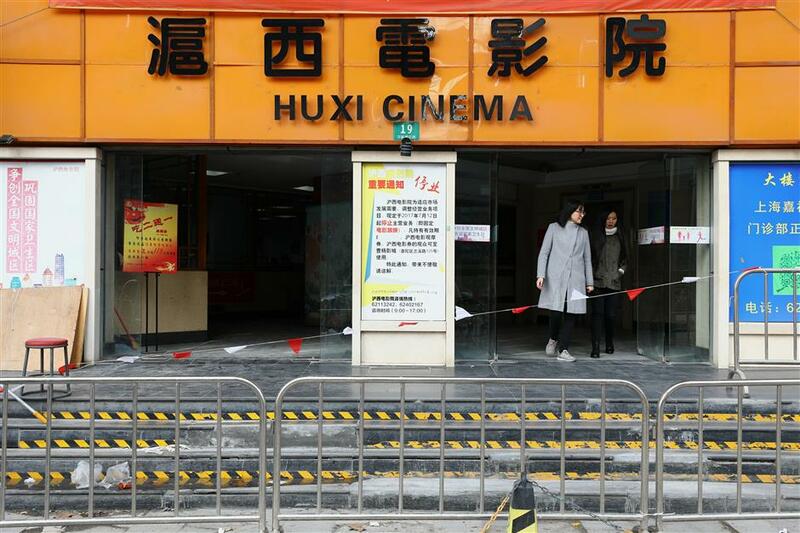 Two women walk out of the former entrance of the Huxi Cinema which has been shut down for renovation.